Mnemba Island is a single small island located about 2 km off the northeast coast of Unguja, the largest island of the Zanzibar Archipelago, Tanzania, opposite Matemwe Beach. It is roughly triangular in shape, about 500 m in diameter and about 1.5 km in circumference. It is surrounded by an oval reef seven by four kilometres in extent. These reefs have been declared a Marine Conservation area. Mnemba Island and its reef are sometimes called Mnemba Atoll which is incorrect because an atoll is an island that encircles a lagoon, which is not the case for Mnemba Island. Mnemba Island is a popular scuba diving site, with a wide variety of corals and associated species, as well as occasional sightings of larger species such as turtles and dolphins. Calm conditions are most frequent in September and October, though visibility is at its optimum in January. 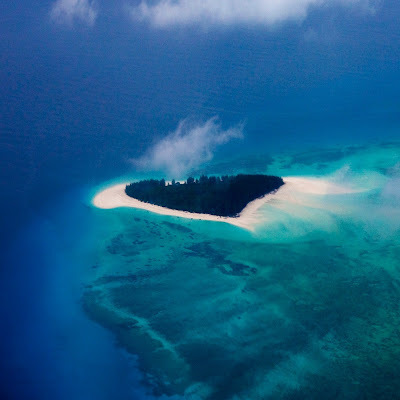 The island itself is privately owned and can be visited only as a guest of the Mnemba Island Lodge, at a price of 1155 - 1500 US$ per person per night (2011 rates). 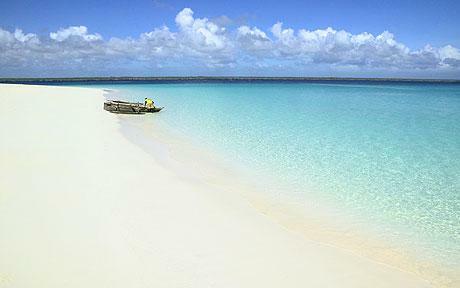 At these prices, the average Zanzibar citizen would have to work 4-6 years to spend one night on this island. If -not being a guest- you accidentally set foot on the island you pay a hefty fine and are then told to leave. When people snorkeling approach within a 200 meter zone around the island they will be driven back by Mnemba staff in boats. Mnemba Island is a 90 minute drive from Stone Town across the main Zanzibar Island, before a twenty minute boat crossing. Approximately 600 species of coral reef fish. Green Sea Turtles can be seen laying their eggs on the beaches between December and May.